Growing in Grace Podcast: 543. 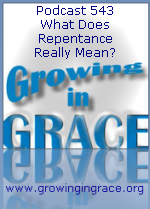 What Does Repentance Really Mean? 543. What Does Repentance Really Mean? When you hear the word repent, what comes to mind? Do you think it means to stop sinning and improve behavior? Perhaps you've been told it means to be sorry for your sins and seek a renewed forgiveness from God. You may assume it involves changing what you do. Did you notice all of the above puts the responsibility on you and depends on your ability? Our response to God should not be based on our ability to perform in a way that is "moral" enough to gain acceptance from Him. Repentance is to have a change of mind. In what way should our thinking be changed? That's our discussion this week.